The first pictures of the Transformers cabinet and playfield have been made available and we bring them to you courtesy of Troy at Top Score Gamerooms. The cabinet features different artwork on the two side. On the right side (shown above) are various Autobots with Optimus Prime centre stage. The left side features assorted Decepticons led by Megatron. The backbox is similarly themed with the Autobots logo on the right side and the Decepticons logo on the left. The battle between the two races of robots is at the heart of the game. The backglass translite image is framed by a border comprised of the two tribes' colours - violet for the Decepticons on the left and crimson for the Autobots on the right. This left/right Decepticons/Autobots split continues onto the playfield but before we get onto that, you might have noticed in the artwork you've seen so far that there is not a single reference to any of the Transformers movies - and in particular the trio of Michael Bay-directed effects-fests; Transformers, Transformers : Revenge of the Fallen and Transformers : Dark of the Moon. Instead, Stern's Transformers - or any of the actors who starred in them. The logo, however, does seem to come from the movies and is different to the ones used in the cartoons and the various video game spin-offs. So the game is mostly based on the cartoons, but with just a hint of the movies' licence. On to the playfield then, and it's clear the days of bare playfield designs are well and truly behind us. This George Gomez design features a wall of ramps, locks and targets covering the upper 40% of the playfield and hiding much of the back of the game. There are eight main shots available from the two flippers. There is a shot to a saucer on the left above the slingshot. Above that is the left orbit and to the right of that is the left ramp. The orbit and ramp shots are mirrored on the right with a very steep right ramp, but it is in the centre where the games main toys live. Megatron is left of centre and Optimus Prime is on the right. also on the right is a captive ball with a yellow Camaro (Bumblebee) behind it which can be hit to push the car into a target at the end of a lane, much like the car crash in Demolition Man. The central area of the playfield is a mass of artwork and inserts. As with everything else in Transformers, it's Decepticons on the left, Autobots on the right together with their respective colorings of violet and crimson. Even the flasher domes and apron decals follow the same colour scheme. The Decepticons featured are Megatron, Starscream, Shockwave, Blackout and Devastator. The Autobots are Optimus Prime, Bumblebee, Ironhide, Mudflap & Skids, and Ratchet. All the plastic parts and ramps are highly stylised as you might expect given George's experience in toy design. Very few of the features on the playfield look like standard parts with even the left ramp being laser-etched and illuminated from beneath. The apron also features some square QR codes decals which, when photographed by a smart phone or tablet with the appropriate software and data connection, will take the user to a related Transformers-themed website. These pictures are not believed to be officially sanctioned by Stern. The playfield in particular looks as though someone placed the image of the apron too high up and added some strange looking flippers. Whether the finished game will feature violet and scarlet flipper rubbers we will have to wait and see. One thing we won't have to wait for is the list of features found in the Limited Edition models. Yes that's right. Plural. 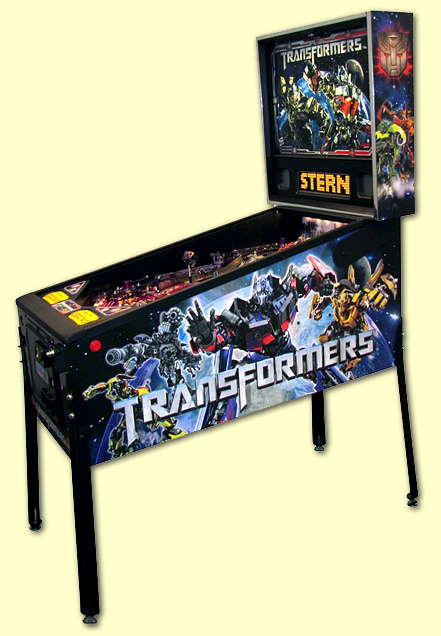 Seeing the LE market as lucrative and easy to attract, Stern Pinball have gone overboard with Transformers, producing not one, not two but three Limited Edition variants in addition to the regular Pro model. 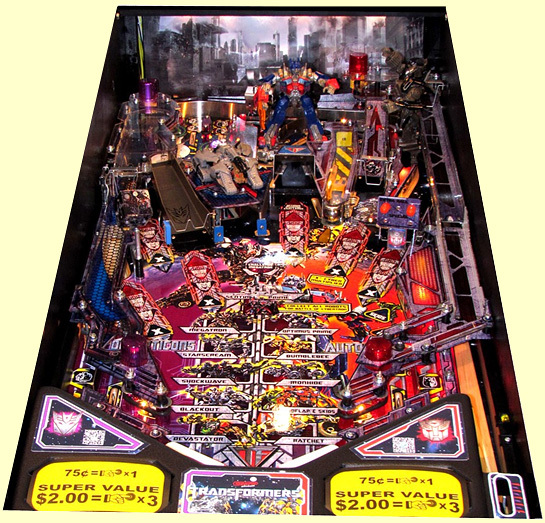 The standard Limited Edition will keep the Autobots v Decepticons theme while adding an upper playfield, more animated and illuminated toys, a shaker motor, a drop target, a second spinner, a metal ramp, violet and crimson side rails and hinges, LED playfield illumination, a second controlled gate on the orbit shot to create additional shot rules and a different Megatron "Cyber Ball Lock". In addition to all that, the usual extras such as illuminated apron windows, playfield sliders and a traditional-style lock bar are also included, and if you buy one of the first 35 numbered machines you'll get a George Gomez signature on the playfield before it is clear coated. Five hundred of these standard Limited Edition models will be made at a premium of around $1500 over the $4,795 base price of the Pro version. However, for another $500 buyers can pick which side they want to support and buy either an Autobot or a Decepticon-themed Limited Edition model. These abandon the half-and-half split of the backglass, trim and cabinet art to concentrate on either a violet or crimson colour scheme. Only ninety-nine of each version will be made, but that brings the total number of Limited Edition machines up to 698. Considering there were only 250 Avatar LEs and 400 Trons, the trend is pretty clear. Stern think they can sell as many - if not more - Limited Edition models as regular Pros. With Jersey Jack Pinball already selling 1,000 Emerald City Limited Edition version of The Wizard of Oz, Stern are fighting back and offering machines at the same price point as The Wizard of Oz was when the first pre-orders were made. The Autobots and the Decepticons aren't the only two teams battling head-to-head in the pinball arena this winter. Transformers will be official launched by Stern shortly with a number of launch parties - including one at Pinball Expo - also expected to be announced. In the meantime, here is a list of the features on the various Transformers models.